Three weeks have passed since my last blog post, May Delays, and I’ve suffered through some migraines, I’ve had my Stelara, and I’ve been extra busy here lately. I’ve had a few doctors appointments for all of my ailments and I’ve got quite a few things scheduled, with appointments, scans, and, follow-ups. Since May Delays, my Crohn’s disease has been hit or miss. I’ve had good days, bad days, painful days. I’ve taken so many stool samples to the VA lab and they’ve taken multiple blood tests. For the Stelara, it was my second self-injection. I picked up my shot from the VA with my other medications, and while they filled the prescription, I had my blood drawn. Oddly, they had me do a urinalysis for a pregnancy test before this injection even though there is no chance I am pregnant; none whatsoever. Before each infusion or injection, my GI care team orders liver and kidney tests, with the normal CBC (complete blood count), tests for inflammation, medication levels, bone marrow, etc. With biologic medications, it is important to monitor your body and its reactions. I’m on Imuran and Stelara, so every eight weeks I get blood drawn. On injection day, I try to prepare myself for stabbing around mid-afternoon. I know I’ll be too anxious in the morning to do it first thing, so noon always seems fair but I never inject on time. I get too anxious and I know I’ll immediately feel nauseated. I ice my stomach, not necessarily for pain but out of habit. The Stelara does not hurt, unlike the Humira and its unpleasantness. With seeing the full needle and having to take a minute to inject all of the medication, having numbed my stomach gives me some kind of piece of mind. You won’t feel the needle this way. When I start to numb my skin, I make sure I have premeds, my Promethazine, Imitrex, and Benadryl. I do not like that experience side effects from most meds, so preparing before is a big deal for me. A migraine is one of the worst-case scenarios for me, once it hits I won’t be able to shake it, so I plan ahead. I usually set out my Stelara beforehand, you want it room temperature but you don’t want it out too long. 30 minutes or so should suffice, just be careful with where you set it so that it doesn’t get broken or shaken. You do not want to shake or break the syringe, and you do not want any air bubbles in the medicine. Once I’m ready to stab, I wash my hands and I sanitize my stomach. I buy boxes of alcohol swabs at Walgreen’s or wherever, I go through a lot of them. Injecting and holding it in while the medication goes in is the hard part. You want to think That the medication goes in with one quick push of the injector, but it goes in slowly. You wanna inject at an angle, and you want to make sure you don’t bubble it under your skin, so rushing the medication is not an option. You just kind of have to go slowly with the movements until all the medication is done and the needle plunger clicks into place and locks the mechanism closed. I feel myself get nauseated every time I do this, taking that full minute, it feels like an hour of injecting. I try to make sure I’m not bubbling or pooling the Stelara under the skin, and I’m trying to make sure I’m focused and not light-headed at the same time. I clean my injection site after and I use an emoji band-aid to cover it. The needle goes into the sharps container and I am finally finished. After, I’ve just felt extremely tired again. This has been a consistent side effect for me, which isn’t the worst considering I have insomnia, so sleep is always welcome. I just get overwhelmingly exhausted and I cannot for the life of me keep my eyes open. I slept until the early hours of the morning, I woke up a few times, but otherwise, I was pretty much symptom-free. The next morning I got called from the VA, my doctors wanted more blood testing. I guess they had ordered tests for before the Stelara, but they wanted others to be done, too. You can see in the second image about just how tired I am. That Stelara wears me out for days. The weather started shifting the next couple days, so I can’t necessarily blame the Stelara or my own body, but I began getting migraines almost daily. I’ve worn my Gonzo glasses more this month than I ever have and I’ve even had to wear my dark sunglasses inside. I’m even wearing them as I am writing this. I’ve gone through so much Imitrex, I run out almost immediately. I’ll see Neuro in three weeks but I may just have to call them and up my nighty Nortriptyline dosage to try to help prevent them. I went to the optometrist again, my damn eyes are irritated again. I’ve been visiting them more often than I have in the past few years. My eye styes seem to be under control, but every now and again, I get one eye irritated at a time, could be the right, could be the left, but I always get the lash loss, too. This time, it was my right eye, with major lash loss. Seeing the optometrist, they tested my vision, made sure there was nothing serious happening to my eyelid, and ain’t was told to return in a month to see what the lid looks like then. If the lashes don’t return or if there is an issue, I’ll be referred to a specialist. That morning, my appointment was at 7:20. I had Grand Jury duty, again, and so I had to be seen earlier than I would have liked. Knowing that they’d be looking at my eyes and skin around them, I had to go to this appointment without any makeup on. Then, I had to drive to jury duty and sit in the parking structure in my car and do my face. Needless to say, my day started with me in a frenzy. The next two days I was serving on jury duty, so I cannot say much there. No phone for me and no information for you. I wore my Gonzo glasses both days because the fluorescent lighting and floor to ceiling windows were blinding me. My migraines do not like that much light, it is a trigger for me, so I had to wear my glasses while the other jurors wondered what I was doing. One person thought I just wore them for fun, haha. Then, another day, another doctor. After my jury duty days, I finally got to meet with my Thoracic surgeon for my consultation. After I saw primary care and general surgery, and after waiting for this referral for months, I finally was getting to speak to someone. This was my first appointment, the VA seemed to consume my entire day. My first appointment was scheduled for 9, my second at 10:30. Realistically, my second appointment happened around 1:30 because my first took so long to be seen. I waited over an hour until the doctor finally came into the room, I had to have this VA call the other VA and tell them they were running behind. I always get the urge to leave after an hour but I’d waited months for this appointment already. I met with the nurse, the student, and then the doctor. I was asked to lay on the exam table, with my ribs that hurt exposed + Oh, yeah, ribs is plural now. A few nights prior to this appointment I could feel my rib popping right under my left breast area. Popping, almost like it was rubbing against another rib, popping in and out of place. From my back left side to the front of my chest, that rib cartilage is SORE. I can move in the wrong direction and my rib will pop now. I’ve noticed it numerous times this week and its shocking, a sudden pain, and it is so damn uncomfortable I feel sick when it happens. But, for this appointment, the doctor didn’t have me pop my rib, but he felt the ribs and moved them a little. He focused on that cartilage area, and it hurt so bad I was crying on the exam table, the nurse handing me tissue the whole time. The image below is my actual ribcage. I tried to highlight the area causing me pain. I explained that I hadn’t had an injury, that it just started to hurt and I finally asked primary care about it. The doctor said at first he thought it was just nutrient deficiency but he was thinking the differential diagnosis of Costochondritis could be more realistic than we thought. I haven’t had a scan of the area in about a year, so he ordered up a CAT scan, with a focus on the left side ribs and cartilage. His suggestion was to nerve block the area, seeing if stopping the nerves would stop the pain, temporarily and then permanently if it helped. Otherwise, removing the painful rib /cartilage area would be the last resort. Preventing surgery is the plan, recovery from that would be brutal. Then, after all that, my face started to break out recently, so I tried to schedule with dermatology but I was sent to see primary care instead, the second appointment at the other VA location. I visited with Dr. C, and I brought up a few minor health issues that had been on my mind, symptoms I’m having or problems that I haven’t discussed yet, that kind of thing. I ended up getting an impromptu pelvic exam, which is always unexpected and is never fun. We are thinking some of my ovarian cysts may be recurring (or they never left) but they still continue to cause me pain, sporadically. Another transvaginal ultrasound has been ordered. Yay, me. My skin, she ordered up refills for previous medications from dermatology. My skin irritated looking at them, I got a band-aid to place over one area, and I ended up with an allergic reaction to the adhesive. I should have known better, it took my skin with it. Otherwise, I still have at least eight future appointments scheduled. Neurologist, rheumatology, optometry, GI, a CT scan, an MRI, with an ultrasound, and a hand surgery follow up to boot. I’ll see neuro for my migraines and my rheumatologist for my allodynia and Fibromyalgia. I’ll see optometry about these damn eyes, and GI about my Crohn’s that is fighting me. The CT scan will look at my ribs, the ultrasound for my ovaries, while the MRI focuses on my nerves in my back affecting my right breast area, and, I’ll hopefully discuss the permanent nerve damage to my left hand after the ganglionectomy. It’s a lot to deal with and keep track of. So, as you can see, I have been busy and I seem to stay busy at the VA. I do get down time but sometimes I feel like I never can catch up. Today and this week so far, I have tried to really focus on this blog post, getting it out there before another month passes without an update. I do update with IBD News Today, trying to mention information that I am currently experiencing and learning about myself. The past few columns, IBD’s Many Comorbid Conditions, My Premedication Regimen for Biologic Treatments, and, Check with Your Care Team if You Have These Concerning Symptoms. 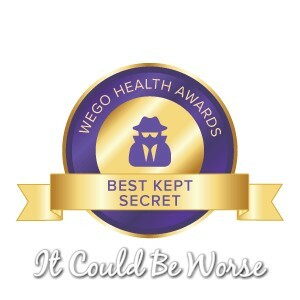 On a positive note, It Could Be Worse Blog was nominated for THREE WEGO Health Awards, Best in Show: Facebook, Blog, and, Instagram. In my personal life, I’ve done a few photo shoots, I’ve been to see live music shows, I’ve voted, and, I’ve been canoeing. Heck, I even got free flowers this week because my name is Mary. How nice! I know I say this often, but I will try to blog for myself more often. I thank you all for reading, sharing and commenting.